Hot on the heels of Monster Hunter 4 Ultimate's Palico equipment DLC, Capcom Japan has unveiled a new line of Palico trading figures. And look at that! There's a Mega Man Palico in there! This little guy is currently exclusive to e-Capcom. What's more, it's a blind box figure so you'll never really know if you have it until you buy the box and open it up. Don't be too discouraged; I'm sure you'll see this on the auction block eventually. See the rest of the figures here. Wow. 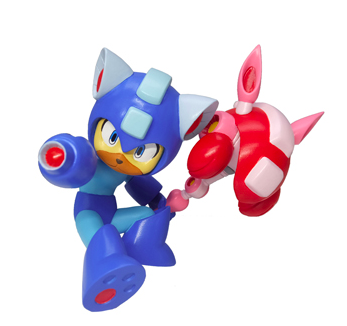 Gotta admit, that's a pretty creative way to pump out more Mega Man related merch. ...is that right?7300 yen?(~$60) ? for a BLIND box? It's a case of 30 something individual blind boxes. I take it Capcom hasn't listed the individual pieces yet. Just what I wanted. To pay horrendous eBay prices for a MegaMan figure that isn't even MegaMan.